Speeding Car Crashes Seriously And Violently Ejects Passenger Through Windscreen. Most of the car accidents happen for being unaware while driving. The horrifying crash happened when a motorist misjudged the speed of his car. The video shows a car driving at full speed into a toll plaza, leading to one of the passengers being violently ejected from the vehicle. The crash took place near St. Cloud, Florida in Osceola County. It was not clear why driver did this. It seems the driver drove his car whole night and he fell asleep while driving. 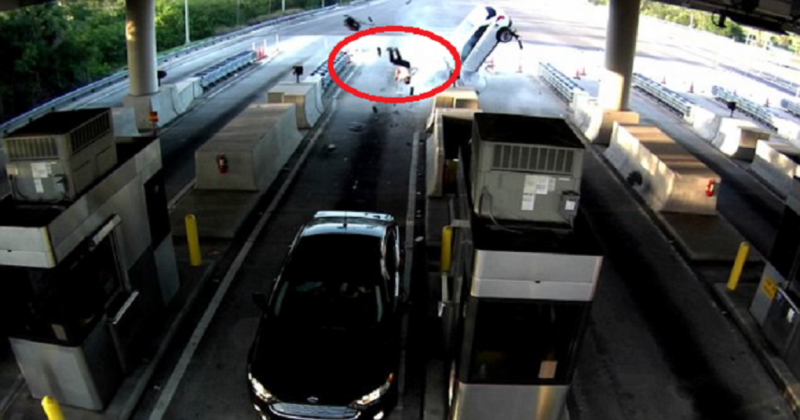 You can see the driver of the car fails to slow down as it approaches the toll plaza on the Florida Turnpike. The car slams into a barrier and this serious crash sent one of the passenger hurtling what seemed like 20 feet in the air. There was also debris from the car, pieces of which were sent flying into the air and strewn across the toll lane. After the accident the car appeared to light on fire. At first the drivers of the standing cars could not realize but later they come out from the cars for help. There were five passenger in the car and it is seen opening the door. Fortunately all five passengers not only survived the crash, but they have all been treated and released from hospital quickly.